Margo Oge is the vice-chairman of the board of DeltaWing Technologies, which is currently creating a new, high-efficiency passenger car based on the DeltaWing race car. She is the retired director of the Office of Transportation and Air Quality and has worked with the Environmental Protection Angey for the past 32 years. She talks to Jason about her new book, Driving the Future, and how the driver-less car will reduce carbon admissions in the future. [2:40] People in the 70s saw that in the future no one will be driving cars. [3:50] By 2018, all car models will have some sort of autonomous features. [7:40] We should see cars get 54.5 miles per gallon in 2025. [9:50] Margo believes the first driver-less car will be the Google car. [16:05] Two questions arise with the autonomous car. Who is responsible when there’s an accident and what happens if the system gets hacked? [20:00] Both the government and the car industry have worked together to reduce carbon admissions. [23:50] Margo believes the Tesla is still a less polluting option than other car models. [26:10] Final thoughts? You can have a clean environment and still experience economic growth. 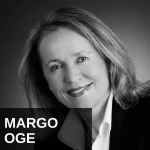 It’s my pleasure to welcome Margo Oge to the show. She is vice chairman of the bored of DeltaWing Technologies. Former director of the Office of Transportation and Air Quality at the Environmental Protection Agency. She’s author of a new book entitled, Driving The Future: Combating Climate Change with Cleaner, Smarter Cars. Margo, welcome, how are you? Thank you, thank you for having me. I’m doing wonderful. It’s good to have you on. Give our listeners a sense of geography, where are you located? I’m located in McLean, Virginia, about a mile and a half from the CIA and seven miles to Washington, DC. Okay, good stuff. So, the CIA is right there. Right there! Good, good stuff. Well, okay, so I’ve been fascinated and I have talked many, many times on prior episodes of many of my podcasts about autonomous vehicles, about self-driving cars. I think this is potentially a lot more of a gamer changer than people might think. I mean, if energy costs stay low and, of course, self-driving cars could make cars use a lot less energy and a lot less fuel, it dramatically increases efficiency, but mobility is going to sky rocket. This is an amazing, amazing thing on par with some of the greatest technologies of the past that have changed the world. What are your thoughts? It’s probably one of the most deceptive technologies that we’re seeing for mobility. You know, if you go back, I think it was 1976 movie, The Imperial Earth. It’s an Arthur C. Clarke movie. Say that title again, I didn’t catch it with your accent. Imperial Earth, okay, Arthur C. Clarke, yeah, science fiction, okay. 1976, I believe, Arthur C. Clarke and he’s coming from another planet and somebody is driving him and he looks around and says, are people driving? And this host, the earthly host is absolutely not, that was banned. If anybody is crazy enough to drive themselves, they would go to jail. So, that tells you how people in the 70s looked at us driving. It’s interesting because one of my friends recently posted on Facebook, he said, he just had a thought that his eight month year old child may never actually learn how to drive a car. There may be no need. It’s probably true. So, let’s look at what’s going on. Clearly, Google, has initiated the effort and there are doing a lot of work in this area, but every major automotive company is working on autonomous cars and even today, some of the cars are semi-autonomous. They have some autonomous activities, but – for example, (#3:50?) is quoted to say by 2018, all cars will have, you know, all the models will have some sort of autonomous offering, you know, fully autonomous cars. I think it’s very consistent with the way that we, you know, we communicate and we work and live today. We are all kind of connected, so if you combine the connected driver-less vehicles with car sharing, with electrified power trains, light weight materials like we have in the DeltaWing Technology race car, you can have significant benefits. You can benefits as far as fuel. You’re going to use less fuel, you’re going to have less accidents, obviously, and you’re probably going to have more productivity, because people are not going to be stuck in traffic, which is something that’s happening today across the planet on all major urban environment and from my aspect, one of the reasons that I think that these cars are going to be very important is because it’s going to be one technology that we didn’t look when we were developing the first climate action actives for cars. We didn’t look at driver-less cars as a strategy to reduce fuel consumption and reduce in-house gas admissions. I sort of wonder, you know, it’s like inflation and deflation almost, because when the price and ease of mobility declines a lot, we may ultimately, you know, it’s sort of like the zero-sum game concept and it comes down to trickled down economics and that kind of stuff almost because we might increase consumption a lot, increase mobility, so the net effect might actually be more fuel consumption, but the minor affect, the micro affect, will be significant increases of fuel consumption – I mean, not increases, I mean, increases in economy I should say, because the cars, once they’re networked together, I mean, the whole concept of the stop and go traffic problem really becomes minimize as algorithms control traffic patterns and so much energy is wasted in breaking, obviously, and that’s one of the things the electric or the hybrid cars have taken advantage of, obviously. So, when you buy a car and you drive and very often you’ll say, gee, you know, I’m not getting this fuel economy. So, the fuel economy is labeled EPA millage values and depending how you’re driving or where you’re driving, you know, I have to admit I’m an aggressive driver, so the stop and go on aggressive driving impacts fuel economy as much as 30%. So, having an autonomous car, we individuals are not driving it. You’re going to reduce the (#6:55?) significantly. Yeah, okay, so tell us about the DeltaWing cars? Is that a carbon fiber car, is that way it’s so light? The race car is, yes, it’s a carbon fiber car, but the most important element of the vehicle is not just the lightweight materials, but it’s the statute of the vehicle. It’s very aerodynamic. So, between the aerodynamic features of the vehicle and the lightweight materials that is used to build it. It offers significant fuel economy advantages that can have companies, you know, existing (#7:30?) admitting their 2025 fuel economy standards, which are going to be on an average 54.5 miles per gallon in 2025. Okay, so 54 miles per gallon, you said, right? Okay, so a car like that. I mean, I’m looking at the DeltaWing vehicle and it’s a race car, obviously, it’s low to the ground. It wouldn’t have any room in it, I mean, that wouldn’t be a car a consumer would be willing to use unless the government mandated it as a proletary car. So, what would be the passenger version of that? The passenger version, basically, will have similar aerodynamics features. The reason that we have it now is to have the car made out of aluminum and it’s going to have enough space to even put a battery pack, if (#8:23?) wants to make it into an electric car or a fuel-sub car or a hybrid where you have a small internal combustion engine and electric motor. The technical analysis that we’ve done for this street car, not for the race car, you will be getting close to 58 miles per gallon equivalent, which is what’s going to be required in 2025 without the electric engine, so you can imagine how much more fuel efficient this vehicle will be if you have a hybrid of if you have an electric power train. I want to get into the electric issue for a moment and really dissect that one with you, but first let’s talk about self-driving cars regardless of how they’re powered. So, there’s a company that I think might be first to market, I’m not sure, their website is GetCruise.com and I believe that cruise is spelled the regular way. It might be CRUZ or some special way. I’m going to look it up right now, no, it’s Cruise.com, GetCruise.com and I believe they are in the San Francisco area and you can go on the waiting listen and they, I believe, they are saying this self-driving car kit, which they’ve tested on Audis sells for like $11,000. I mean, that’s really reasonable. Are they really going to make it? They say this is going to come out this year, is that truth? Jason, I can not comment, but I can tell you for a fact that I believe the first driver-less car will be the Google car, that’s my prediction in 2017. Oh gosh! Two more years. I don’t like waiting that long, okay. So, you think it’ll be and it’ll be that little ugly Google car, that’ll be the first one, you think? I would not call it ugly. It will be a Google car, yeah. Okay, so you think that’ll be first to market and not Get Cruise, not a kit, but a whole car that comes that way and who is closest right now? I believe it’s the Hyundai Genesis if I’m not mistaken, that seems to be the closest thing to an autonomous car now that will pretty much drive itself on the highway. The Hyundai Genesis. Mercedes has a number of models. Nissan has a number of models, BMW. You know, the driver-less car is much closer to what we think and if you have 90% driver-less operations, in my mind, it’s almost autonomous. You know, where the driver is going to have to interfere whenever the (#10:57?) interfere. So, it’s much closer than what we thought, you know, even three years ago. Okay, so let’s explain to the listeners what a 90% self-driving car is. Now, to me, that means that you have laser guided cruise control that will come to a complete stop, so if you’re on the highway, you won’t rear-end another car and it will, the Hyundai Genesis claims and if our listeners want to check out a video, I think it’s called Ghost Drive, they did a commercial for it, which is pretty amazing to watch, the ghost drive where all the drivers are driving along the road and they jump out of the cars onto a passing truck – they are stunt drivers obviously, and the cars drive themselves. It’s amazing. So, they say the car will obviously stop and go on the highway and it will also make gentle turns, that’s the way they describe it. What’s a 90% driver-less car? Is that what it is? Well, you know, on a highway, that’s exactly what it is. Now, you’re going to have more potentially interference with a driver when you’re in the city and you have many more potential opportunities for the driver to get involved in the highway, because highway, even today, you can put an automatic cruise and it takes you there without much interference. Right, you still need to steer and the old version of cruise control will not stop the car, so that could be more dangerous, but I have often wondered about the Hyundai Genesis, how it will drive itself on the highway pretty much, what if a deer or a coyote or something runs into the road, will the laser guidance system see that? Will it see – what if there’s an object in the road that fell off a truck before, will it go around it? I mean, what does it do then? That is the whole issue of connector, you test to see it. If you have to see the objection that you didn’t expect them to be there, so certain information will come from existing GPS or new GPS systems, but you have to have sufficient capability in the vehicle to see and expect it. I mean, driving in city conditions is much more complex. I could just imagine the amount of data that the machine would have to process. It must just go up by a factor of ten in the city, because you’ve got cyclists, pedestrians, you know, wow, the complexity is dramatically increased, right? And the self-driving car that Google has been working on for years, you know, that is really been driving around the Silicon Valley area where they’ve mapped so much detailed there that they haven’t mapped around the rest of the country and when I say that, I’m talking about the height of curves. I’m talking about driveways, an incredible amount of detail that’s really not mapped in the rest of the country or the world, right? That’s why I personally believe Google is ahead of the game of everybody else and you mentioned the car being ugly and small, clearly this vehicle may not be the vehicle we’re going to see on the road, you know, it goes about 25 miles an hour and the basic purpose of this vehicle is to design all the potential inputs that a car would need, not just on highway, but also on urban driving to be completely driver-less. I’ve heard the Google kit that they’ve used on the Prius quite a bit is about $75,000. Do you know the numbers on that? No, I don’t. Actually, I interviewed Ron Medford, a colleague of mine who was working in the government for the Department of Transportation and he’s now the safety director for Google, you know, they are very, they’re not willing to share a lot of information, but according to Ron in the interview I had with him, he views that the Google driver-less will be probably one of the most dramatic change of evolution that we’re going to see in cars beyond, you know, catalytic controls or seat belts or anything that we have seen. Oh yeah, most definitely. Having worked in the government, you know, there’ got to be a lot of talk about how will they legislate this, you know? If the self-driving crashes, whose responsibility is it? You know? How do insurance companies deal with this complexity and then what are you allowed to do? I’m sure this will be an iterative process, of course, as time goes on, but you know, are you allowed to go to sleep in your car? Can you text? Can you use your laptop? Can you make love? You know? I mean, what are you allowed to do? Can you drink? Okay, Jason, you love driver-less cars, obviously. Clearly, I see two major issues and what government and the private sector is working, one is the issue, who’s accountable, who’s responsible? So, there is an accident, who is responsible? That’s a very important issue there. The second is also very important, it’s the whole issue of hacking the system and we’ve seen, you know, Telsa being hacked, so how do we deal with this, you know, two major issues, but in my view, they are not issues that we have not doubt before with many other public polices in the country and they are so challenging that it’s going to stop the vehicles on the road. A number of states, I think six or seven states already have given, you know, the go ahead for companies to test out driver-less cars on the road. So, it’s coming, but can I talk to you a little bit about my book? Sure, yeah, absolutely! Yeah, I thought we were talking about some of the stuff covered in the book, sorry! No, part of the book, maybe a little bit more about the book. So, as you said, I have been with the government for 33 years, working – I’m one of this extraordinary-like people that woke up every morning and I knew that I was making a difference because I was working on a number of environmental issues and for the past 18 years, I was director of the Office of Transportation and Air Quality where we took actions, many actions together with the car industry. We worked with oil industries, airplanes, with tractor trailers to reduce admissions from everything that moves and pollutes, but the last four years in the government, I was involved with the first action that the government took toward this climate change from the transportation sector and the transportation sector is one third of the greenhouse gas admissions in the country and very few people know that the despite the inaction on the last three decades, in 2010 and 2012, we took actions to improve the fuel economy and reduce the carbon footprint of new vehicles, so if you’ve recently bought a car, there is a very high likelihood that the car that you bought is both more fuel efficient and cleaner than the car you bought five years ago and you’re saving money at the pump. By 2025, the average new car will get double the fuel economy, as we said earlier, 54.5 miles per gallon, will admit half the carbon pollution and it will save on an average the consumer $8,000 of fuel costs over the life of the vehicle. So, driving the future is really the journey that we took from the 50s and 60s when Los Angeles and other parts of country looked like Beijing looks today and I don’t know if you’ve been to Beijing, but you can not breathe. I’ve read the articles, yeah. It’s awful and this is what the US looks like in the 50s and 60s, so it’s the journey. How did we go about, you know, making car so clean, to get cars 99% cleaner and at the same time, you know, growing the economy, we have more people on the road and we drive more cars on the road to 2010 and 2012 when we took actions to reduces the admissions, the carbon admissions from the cars. We took the first climate action that the country has taken. So, it’s the journey of that. We’re talking about the science, the law, innovation, technology, politics, nothing in Washington happens without politics, people, and then the historical (#19:50?) between government and industry. This is the first that I know of where the government and industries sat together and said, okay, work together and we’re going to have this agreement with car companies, we’re going to move forward and they’re going to innovate for cleaner, more fuel efficient cars, vehicles. So, that’s the first part of the driving the future. The second part of the book is where I describe the market trends and there’s where some of the issues of connected vehicles and autonomous cars in play, which I call the social trends, which is the connected living and working and that is really going to be a big driver where, you know, cars are going to be more like cellphones. We’re not going to just use them to drive us from point A to point Z, but also other market trends like what’s going on across the planet. The US is not the only one that is acting to improve the efficiency in the carbon footprint of cars. 75% of cars sold across the planet today have some form of fuel efficiency and greenhouse gas admission standards and all this will converge into 2025 and the other big market trend is the mega cities, you know, back in the 50s we had only one mega city, 10 million people, which was New York City. Today we have 26 of these cities. Three years from now, we’re going to have 37. So, the mega cities need to reduce pollution and congestion and that’s again where you’re going to see some of these market trends influencing the car of the future beyond 2025. So, what about the cost of all this? I mean, with all of these enhancements, of course, a lot of has caused industry just to innovate, which is wonderful and bring the cost down, but you know, some of these enhancements, I mean, you know, when you put a regulatory burden on the automakers, the cost goes up, right? It goes up, but the beauty of this, when you put a catalytic converter on a car to reduce admission, the costs goes up and the benefits of public health benefit. I mean, you breathe cleaner air. We have less – fewer people going to hospitals, fewer people dying prematurely because of cancer. Let’s get them to stop smoking too! Yeah. Yeah, stop smoking too, but when it comes to reducing the carbon foot print of cars, it comes along with improving fuel efficiency, because the oil you burn, the less carbon you pollute, so just to give you an example, in 2025, the cars will be more expensive. We estimated about $1,800 per car to double the fuel efficiency, but the net benefit of the car, so you’re going to pay more money, you know, to buy the car, but just on fuel savings alone, if you keep the car for ten years, you’d be saving $8,000 and not only that, the country is going to be saving $1.4 trillion dollars of cars dealt from 2012 to 2025 on fuel savings. So, this is money that we don’t have to go out and buy gasoline and diesel, but money we can buy, you know, go to a movie, I don’t know, an additional game or pizza, whatever. I’ve got to ask you, what do you think about, you know, when we talk about the power train issue. For example, what are your thoughts on the Tesla? Is that really in the stage where it’s still more of an experiment? I mean, I’ve read a few articles that say that the Tesla is more of polluter than a typical internal combustion car when you take into the account the entire equation. I don’t know how people think electricity is non-polluting. It has to be produced somewhere. 60% of it comes from coal, so I jokingly say that Tesla is the first coal powered car. Well, that’s a good point, because you have to account for the energy sources of the car, but regardless, so, if you drive a Tesla in California, most of the energy comes from renewable.. But a lot of it’s nuclear in California. Yeah, so you have no pollution really, so regardless where you drive the Tesla, even if you drive it in Colorado, which is all coal, you’re going to get better, you’re going to get low carbon admissions than driving a gasoline car or a Prius car. I mean, that’s the case. If you drive, you know, in New York, you drive it in parts of the country that coal is not as big of a player, you’re going to then get great. So, I think the message is, if you’re driving a electric car like Tesla, you’re doing well to the planet, you’re using the gray house gas admission. Now, as far as is it an experiment. I don’t think so. I think earlier in the process that traditional car manufactures thought this was just going to pass. It’s not going to be successful, but I think Tesla is successful. He has been able to create a vehicle not only the customers love, but an envy of the competitors, everybody is competing and Tesla is selling more cars than what you’d expected two-three years ago and there are more into produce a car that’s going to be in the mid 30s, which is fantastic and you see General Motors trying to do the same with the Bolt. So, I think Tesla in my view is here to stay and it provides, it’s a lot of competition for the traditional OEMs. Okay, very interesting, very interesting. What else would you like people to know? What I like people to know is that you can have a clean environment, clean air, clean water, we can address climate change and at the same time we can have an economic growth. So, what I’d like people to know is whenever an EPA makes this, my 30 years experience, whenever they went forward with a major regulatory effort to reduce pollution from air or make water cleaner, time after time, the industry came forward and said it can not happen, you’re going to destroy the industry and time after time, we have seen not only the industry where they want to do, very often they even did it better and early. Look at cars, cars are even cleaner today than what the government requires. So, we’re dealing with probably the biggest challenge that our planet is facing, that our economy is facing, and national security is facing with this climate change and the things that we can do and must do to address the impacts of climate change and this first wonderful program we did for cars is an indication we can do it for other sectors, we can reduce the carbon footprint for coal-burning power plants. So, Margo, give out your website and tell people where they can find out the book. You can find the book Driving The Future: Compacting Climate Change with Cleaner and Smarter Cars at your local bookstores, hopefully the libraries are carrying it. You can also order it on Amazon today and thank you so much Jason for having me on your show. I really appreciate it and good luck with the driver-less car. The keys that you’re looking for. I can hardly wait! I can hardly wait. You know, one of the things I should just mention in closing here is that one of the big deals, we didn’t talk about this, but feel free to comment on it now as – sorry for the last minute question here, but my thesis that – you know, I have a real estate investment company and I investment significantly in real estate and the whole game real estate forever has been, you know, the old saying, the three cardinal rules of real estate, Margo are location, location, and location, and I really think that the driver-less car as long as energy costs stay reasonable is a game changer. I think it will put pressure on those three cardinal rules and here’s why, if you think about it, you know, I grew up in Southern California, I grew up in Los Angeles, then lived in Orange County as an adult, very expensive real estate markets, obviously. Now, I live in Phoenix, a lower priced real estate market, and if you can go to bed at midnight and wake up at seven AM, you can go to bed in Phoenix, wake up at seven AM in LA or New Port Beach or San Diego, you know, do you really need to live there? You know, I’m not saying it changes everything. I just believe it puts pressure on it. It does, but also don’t forget that a lot of the services that we’re going to be getting will go on demand and share vehicles, but Jason, they are calling me for my other interview, but wonderful talking to you. Thank you so much.